McAfee is an American based global software company that provides technology security applications. The company recently became part of Intel Security in a move designed to integrate anti malware and anti spam solutions among other innovations. In 2015 there were over 7500 employees in worldwide offices. To contact McAfee you may call 1-866-622-3911 or find support here. You may also send CEO Chris Young a letter through post by addressing your letter with Regional Office, Intel Security Corporate Headquarters, 2821 Mission College Blvd., Santa Clara, CA 95054 USA. Top selling products include McAfee LIVESAFE Firewall Tool Kit, MF AntiVirus Plue, MF Total Protection. Social media presence and support may be found on Facebook, Twitter, YouTube and Google+. I had a reminder to update my account as the years subscription was up. I logged my credit card details in and all was approved. If not, how could this be a scam ? I was charged for mcafee but did not request or authorized this to be done. Notified bank and now you again I will be filing fraud charges on Monday Feb 4th. I would like my money back really do not know how you took it out of my bank account with out my permission but will be looking it that legally also. Dell . System mechanic did.7. I have had a virus. MCafee failed to detect it. Your technicianfound the virus and left it at that. My other computer which is an HP 250 G notebook runs windows 110. Hundreds of hours of work have been lost. bought a brand new laptop, at the same time I purchased McAfee livesafe. Twice, I had to call customer service because key was accepted but product wouldn't download. Both times I had different gentlemen that were difficult to understand. The first gentleman tried to tell me I needed to buy a firewall or purchase the McAfee lifetime software. The second gentleman also tried to tell me that I needed to upgrade my McAfee. That my brand new computer had viruses and a Trojan. Took my laptop back to store of purchase, to be told there were no viruses or Trojans, that it sounded like they (McAfee) were just trying to get more money. If I would have realized all the difficulty with McAfee, I would have just purchased Norton. Your firm stopped my protection, TOTALLY, on the 7th August 2018, which caused my computer to be infected by all sorts of viruses. It was switched back on two days later, and I was under the impression it was a blip. I was having trouble uploading my Mcafee Live safe activation card and was connected with IT who then passed me on to one of your technicians. By the name of Alan Johnson who was very rude and was tryibg to sell me something I didn't require as my broadband has Sky shield protection. I kindly told the this Alan that I have just paid £800 pounds for a laptop and an extra £69 for your Live safe premium, he then persisted that I buy one of these bundles that I don't have the money for at present. Because of this he then Hung the phone up on me. On Monday, August 13, 2018, I had a somewhat threatening, and very unprofessional. exchange with one of your employees. After an unsuccessful attempt by MacAfee to fix the problem, in a threatening tone I was TOLD to give my personal banking information in order to obtain a refund, which I NEVER requested. During my time in England, I am aware of ongoing bank fraud; personally, as well. I refused to give the information. So, I was informed I HAD to submit bank information, AND had to accept refund [due to MacAfee's failure to secure the computer]. I said I would speak to my UK attorney, and the terse reply was: 'we have lawyers too'! The result was my laptop was cleared of ALL MacAfee information. The tech HUNG UP on me. He was the SECOND tech I dealt with that day. The first one was supposed to call me back within 15 MINUTES. Never did. During my stay in England, unprofessionalism is a daily occurrence; but not a threatening manner. So, I will now contact my attorney. I will also contact the media. Being used to American high standards, and top class customer service, this behaviour will not do. As I am dealing with post stroke, this whole matter is unforgivable. On Monday, August 13, 2018, I had a somewhat threatening, and very unprofessional. exchange with one of your employees. After an unsuccessful attempt by MacAfee to fix the problem, in a threatening tone I was TOLD to give my personal banking information in order to obtain a refund, which I NEVER requested. During my time in England, I am aware of ongoing bank fraud; personally as well. I refused to give the information. So, I was informed I HAD to submit bank information, AND had to accept refund [due to MacAfee's failure to secure the computer]. I said I would speak to my UK attorney, and the terse reply was: 'we have lawyers too'! The end result was my laptop was cleared of ALL MacAfee information. The tech HUNG UP on me. He was the SECOND tech I dealt with that day. The first one was supposed to call me back within 15 MINUTES. Never did. During my stay in England, unprofessionalism is a daily occurrence; but not a threatening manner. So, I will now contact my attorney. I will also contact the media. Being used to American high standards, and top class customer service, this behaviour will not do. As I am dealing with post stroke, this whole matter is unforgivable. hang ups, chat support disconnects etc... rather strange how many of the calls the person will say they " are disconnecting " or hanging up hmmm my fault? We are committed to your complete satisfaction. If you are unhappy with your McAfee Support Experience, please submit a case online to our Total Satisfaction Team and let us make things right. We will take ownership of your problem until it is resolved. That's the McAfee promise!! how dare we expect help or an answer to a simple valid question!! cant have that now can we? so lets review here shall we I contact them about an issue they have with there product and I'm the bad person? Today I decided to renew my McAfee protection before the due date in January 2017, hoping to get a better deal. I firstly engaged in a live chat but, was eventually contacted by a chap by the name of Alexander. After discussions I downloaded requirements as directed. I was then asked to provide a credit for payment of $49.99. I told Alexander I only use Paypal on the internet. He insisted I provide a credit card for this transaction otherwise no deal. I then cancelled same. As the downloaded pieces were removed from my screen ( he had control of my computer ) loud music and " youre an idiot " and other images appeared on my screen. Of course I cannot prove Alexander did this but, the fact it all appeared as McAfee docs were disappearing certainly seems very obvious to me. This caused me embarrassment in front of my wife who was there at the time. Because she has dementia it confused her even more. Not appreciated. McAfee took my monthly payments out of the wrong account. Called billing department and they wouldn't transfer me to corporate. Now I have to provide proof that they made a mistake! Whose money is this again? Could not get McAfee to download. So I called online customer service for assistance, the employee who answered at McAfee headquarters was extremely rude and argued the whole time I was on the phone, he also said he was going to charge me $249 to fix my computer because he was an expert I told him to forget it I wanted to cancel he said I couldn't I told him I would cancel the credit card transaction. He said good luck with that in a rude tone of voice. He called my house at midnight, woke me up and started again. This is the worst company I have ever seen. I wish I could give it a minus star! McAfee really needs to train their techs to speak English and to treat people with respect. I am a McAfee subscriber with something called Live Safe costing, if I remember rightly, £89 per year. It has now glibly informed me my PC is suffering from a very annoying pop up called Browzefox which they will happily remove for a fee of £59.99. Just wanted to get that off my chest while I find different cover. In this regard any recommendations will be appreciated. A few years ago I was told I must have tech support in order to get into AOL chat rooms so I kept tech support. I have called a few times asking again about needing tech support in order to get into AOL chat rooms and the answer remained yes. When in a chat room I would ask the question about having to pay for McAfee tech support and others would tell me no. I would also see people saying they haven't had to pay anything for AOL in years. I feel AOL and McAfee employees lied to me over n over and I lost a lot of money. The only purpose for me getting on AOL is for the communication with others being I am disabled. When I called 1-800-827-6364 and employee answers my call and I asked to speak to a manager they would send me back to the 1-800 again. Finally after the third time calling I got a manager. His name is David Meed, not sure of the spelling. He was very rude first time talking with him. He would talk over me and always had a very stern voice. He didn't care about what I had to say but rather pointing out I was wrong/lying. Then the second time I spoke with him after asking to speak to a manager to complain about David Meed they give me back to him. He then was a bit better talking to me but still didn't care that McAfee tech support employees mislead me a few times. David said I download McAfee which cost 7.99 for service. I only remember downloading free antivirus. David could not tell me when I downloaded the McAfee. He then said it didn't matter. If I had been told correct information a few years ago I would have never had tech support. I feel violated and embarrassed when I tell others what has transpired. The remaining balance is $23.97 and I feel this balance should be taken off and balance be $0.00 for the incorrect information I was given not to mention the hassle and how rude the manager was along with in those year AOL would raise the monthly payment from $4.99 to $7.99 and even higher a few times. Please help me with this matter. I purchased MacAfee anti-virus in February of 2016. I downloaded the program, paid the fee and was immediately barraged with pop-ups. This was not only annoying, it was also alarming. I had all the blockers on and still I had programs running throughout the background. I was dissatisfied and was in a telephone loop to lodge a complaint. I suffered through another month of having to shut down my computer to get rid of programs that were constantly running and slowing down my computer. Then one day, when I could no longer take it, I went to a local computer store and they informed me that I had thousands....yes thousands of computer viruses corrupting my laptop. I paid them and they installed 2 new anti-virus protection and I have had no further problems which lead me to believe that MacAfee is an INFERIOR product and I am a very unsatisfied customer!! I will never ever do business with that company and I will tell everyone I come in contact with about my dissatisfaction. I had a terrible customer service experience with McAfee chat online. I got the person's name, Midhun from Intel Security Technical Support for McAfee Products. I needed to install McAfee online but they did not help me. I called the Mcafee customer help line for a virus issue. I have a three year subscription, paid in full with the purchase of my computer. They wanted to charge me another $200 to assist me. When I complained, and asked for a supervisor, I was told I would be contacted with in two hours. It is 24 hours later, and I still haven't heard from an advisor. Horrible, and I mean horrible customer service. Yesterday I rang McAfee customer service line as have a problem with my computer. Every time put it on there is a red sign comes up saying that the firewall is off. Have to go into the McAfee icon to turn it back on again this is happening every time the computer is put on. The telephone number that i rang was 0800-310-1001 and the person that spoke to was Ranjan who said that he would help with the problem. But did not do it. Wanted me to take out 4 years package which would have cost me £143-00. Did want to do as only buy 1 year at a time my credit card has run out til get a new one where he said I was lying to him. I did not expect this from someone who is supposed to help a person if they have a problem with that company's product. The product was installed by McAfee last year and is still in warranty and is valid til the 15/05/2016. I called to cancel my McAfee Spyware protection professional over 7 months ago and you still are pulling the money from my bank account and did not cancel it. I want it canceled as of this month. Please do this right away and notify me when it is done. In January 2015 I purchased Total Protection -23zvp-6e7dk-kr395-apfja, unfortunately this would not install therefore was invalid. As I wished the Total Protection that you offer and which I had already purchased and paid for I thought that I would install again. I contacted MacAfee explained the above and was advised that in this unfortunate circumstance I would be offered this support however my lap top required servicing. This I agreed, paid the amount of £80.00 and then was advised by a technical advisor from Guruaid that I would have to pay and additional fee of £50 to complete the installation. I have discussed this concern with a supervisor and after spending approximately 3 hours on my lap top I had to end the conversation due to sheer frustration. I would be obliged if you could consider my concern and to resolve this situation. You said my account had been hacked. I have McAfee and security essentials protecting my account. I followed your instructions and used another email address to receive a code which allowed me to reset my password. You said: Account is now recovered, you can sign in. Nope, would not let me and wanted to run me through all this again. This is ridiculous! On 1/29/16. At 3:00 am this morning. I reset my T-Mobile ( Lumina 530 Nokia Smart phone. I did all the safety, steps that " Microsoft ask of me. But while syncing my apps. Things seem to be ok. But while storing a downloading my game apps. Once again Candy Crush saga. By Kind Developers. It begin to download even if I had 2GB's left. The game downloading strip was just about done. And it happen! It went back to Pending! And this time also. I received a error message. Which stated " Error! And someone wants to know. The number started out as 800. Unfortunately I did not understand the error message. Nor the code. So I uninstalled right away. I then proceeded to download a game similar and it was 21- GB. But had no error message. I am reporting this because I feel as though I needed too. And if I need to change, or secure more on Microsoft. Please email me and let me know what have to do about this issue. I regularly had problem with my desktop with virus attacks and I have tried all possible ways to avoid. My manager suggested me to try McAfee and it is really secured. 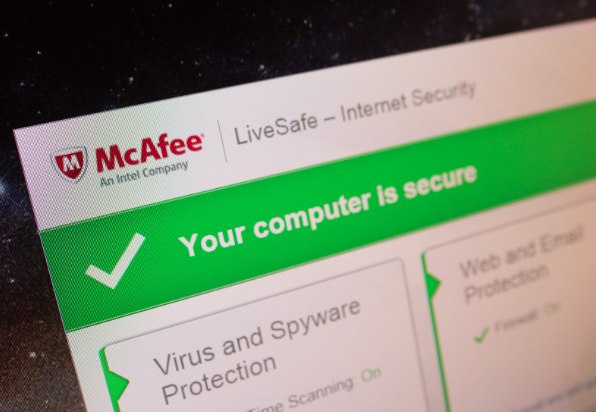 McAfee solutions gives complete virus protection and Internet security. McAfee is available for individuals,Enterprenuers,small business. McAfee is available round the globe. Free trails are available with cross device protection, mobile protection,security advices and many more. You can order it from any where and anytime to protect your PCs,Mobiles and laptops. McAfee used to be a good virus protection company, what has happened to them? I was having numerous error messages appear indicating virus’ I went on the Web to find a solution and ended up connecting to a site I thought was McAfee. It ended up that I was charged $49.99 for a service, it started at $249.00 and ended at $49.00 for a one time fix. I discoverd that the site was not McAfee and stopped payment with my bank had my accouint cancelled and a new card issued. I then contacted the real McAfee customer service number. I thought that the McAfee program was inclusive fo allr viruses but McAfee tried to hit me up for $100.00 plus for a clean-up service. Could you please tell me what is going on and why do I need a cleanup service when Mcafee was suppose to protect me in the first place. I am having a hard time to make ends meet without having to pay additional charges for a service I thought gave me complete protection.